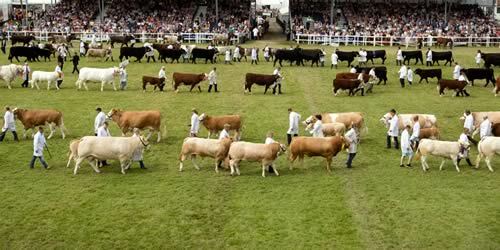 Almost 7,000 of the finest livestock will be making their way to the Royal Highland Show, one of the UK’s premier agricultural shows. Organisers of the event, which takes place from 23–26 June, are preparing for what will be an exceptional exhibition, with notable entry numbers across many sections of the Show. Unsurprisingly, given the economic problems in the dairy industry, the dairy section has taken a dip, down 23 to 110 (133); Ayrshire the most notable at 18 (31) but Red and White bucking the trend showing an increase to 13 (11). “Once again it is clear that the Highland is the place to exhibit, with entries up across the board. It will be a packed house but we are working hard to ensure that we can cater for as many exhibitors as possible, with changes to the layout of the sheep lines and continuing to upgrading the showground in a number areas not least of which is the new livestock flyover.